Freeview Aerial installati­on and Home Theater Setup. We can also provide Quality Wall Mounts so your TV is safe and secure on the wall. Freeview aerial, mount, cabling and tuning one TV, $250. For each item not required ie, mount or cable, reduce $25 each. We will use either the 43 or 91 element type antenna, depending on the signal level in your area. At time of installation can add extra outlets for $50 unless using existing cables. $50 extra is charged in locations where signal is weak and will inform customer before starting any work. $250 for supplying and installing flat or tilt type wall mount, size 28-65inches. For 66-82 will cost $300. 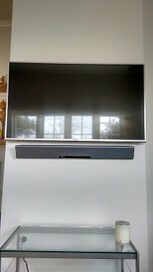 If customer supplying the wall mount, then it will cost $140 to install the TV and $200 for 66 inches or longer. Will try to hide cables inside the wall unless there are beam/nogs blocking path. Otherwise, will use white conduate tube. No cables or wall plates included, all extra as per need and requirement. If installation of the cables must be done inside the wall, it MAY be possible but will need to see the job first. It will cost $40 to visit and discuss how the cables could be done if at all possible. Also will have to discuss power source for TV and or soundbar, types of wall plates options, audio cable, HDMI and Freeview cables. After the discussion, I can give you a fixed price for completed job. *Freeview aerial and satellite MATV setup for schools, motels or boadrooms. Great service and well priced. Thanks for creating a lovely little sanctuary for me in my bedroom. Excellent work. I can't believe that we didn't mount the TVs sooner. Looks amazing and the cost was very affordable. Friendly, efficient, and knows his stuff. Improved the sound quality of our tv and made our Freeview streaming much better. Highly recommend him to everyone! Thank you for great service. Fast and easy communications. Highly recommend! Dean is a real professional. He listened to what I needed - a new light fitting and a UHF aerial installed with cables running under the house, and the finished job was super neat and tidy. You can trust him in your home, he is super friendly and the price was extremely fair considering the labour and parts he provided. HIGHLY RECOMMENDED TO ALL, cheers Dean. If you're looking for someone to wall mount your tv etc.. then look no further! Trust me! Friendly guy. Fast. Far more reasonable compared to other places! 10/10. 5 Stars. This guy is THE MAN!!! Dean is an efficient and friendly bloke who loves his work. He took great care in the wall mount install and walked us through some of the TV's capabilities. He then also provided some valuable advice on some other work around the house. Top guy! Highly recommend. excellent service, installed a sat dish when cyclone cook came thru, and he still put i up in the downpour. amazing and a nice guy. Great job, thank you Dean, will certainly recommend you to others. great service dean. very prompt and very informative. great advice too. will use your service again in the future. Dean was amazing, turned up early(not normal for a tradie) was helpful, extremely friendly as well as professional to deal with(he also played with our 2 year old daughter who turned into his best friend). Note, he also stayed longer to help us tune in the TV, log in etc. Would have paid more if he asked but kept to his word. Highly recommend Dean, rather than all those big name companies out there.